Mary Goose, in error, has often been called the original Mother Goose. 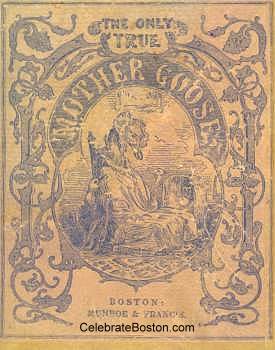 The following describes the history surrounding the myth of Boston's Mother Goose, with some of the ancient nursery rhymes listed at the bottom of the page. Isaac Goose was a wealthy landowner in Boston who married Mary Balston. 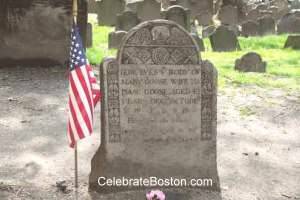 She died in 1690, and was buried at Granary Burying Ground. Mary Goose bore ten children with Isaac. After Mary's death, Isaac married Elizabeth Foster of Charlestown, and she had six children. One of those children was also named Elizabeth. On June 8, 1715, Thomas Fleet married the younger Elizabeth. Fleet was a prominent printer in Boston, having recently fled from England during the Queen Anne Riots. They lived in a residence on Pudding Lane (Devonshire Street), that also contained the printing shop. Thomas and Elizabeth then had a son. Elizabeth (Foster) Goose, "like all good grandmothers, was in ecstasies at the event; she spent her whole time in the nursery, and wandering the house, pouring forth, in not the most melodious strains, the songs and ditties which she had learned in her younger days, greatly to the annoyance of the entire neighborhood, to [Thomas] Fleet in particular, who was a man fond of quiet." After some time, Fleet gave up in attempting to convince his mother-in-law to subdue this behavior, and contrived to document her melodies—as well as rhymes from other sources—and publish them in a book. In 1719, Fleet published the book Songs for the Nursery; or, Mother Goose's Melodies for Children. In 1833, only one copy of this book apparently still existed, and was re-published as The Only True Mother Goose. It is due to this book that the myth began that Mother Goose originated in Boston. What was in reality a compilation from multiple sources was likely embellished because the mother-in-law's name was Goose. Thomas Fleet's book was likely the first use of the pseudonym Mother Goose in English America. The earliest reference in history found for Mother Goose dates to 1650, in Jean Loret's La Muze Historique as part of a poem. Charles Perrrault later published a book of children's tales in 1696 called Contes de ma Mère L'Oye, which included the famous Sleeping Beauty and Cinderella stories. So Mary Goose, who has been incorrectly called the True Mother Goose or Boston's Mother Goose, was not even related to Elizabeth Goose, the mother-in-law that inspired Thomas Fleet to publish a book of children's nursery rhymes. The myth was apparently created to make her gravestone a tourist attraction, and was successful at achieving this goal in the 1950s through 1970s. Mary Goose had died in 1690, while the Mother Goose book did not get published until 1719.